ps – That biggest improvement in service, means for the most riders. The title of the post could probably be rewritten as “Ontario’s 2015 Budget and GTA Transit Projects” given the total ambiguity in the budget with respect to Hamilton. Even without a fancy announcement like the ones held for the Hurontario LRT or the Go train electrification, I was expecting more clarity with something like line item with a dollar figure and timing specified for Hamilton to give a firmer idea of how much money’s available to work with and when. Additionally, the new Go station’s supposed to open soon, but no service schedules for either the Pan Am games or ongoing commuter use have been published yet and the all day two way service as promised by Dalton McGuinty in time for the Pan Am games doesn’t appear to be in sight. I’ve heard that there are going to be only two round trips a day out of the new station in addition to the four existing trips out of the Hunter St. station but I don’t know how true that is. Given this state of affairs, the idea of Steven Del Duca visiting Hamilton at some point in the next few weeks on an unspecified date to announce something, also unspecified, is not exactly encouraging. I suspect he’ll either make a vague non-announcement and kick the can down the road even more or seriously under-deliver on any kind of meaningful transit improvements and make a woefully inadequate announcement like Ontario’s going to buy HSR a 30 foot short bus so they can run a shuttle between the two Go stations or something similar. We’ll see what happens. In the meantime, I totally agree about the track record the provincial Liberals have for delivering on transit promises. It’s abysmal. They and Metrolinx need to get down to business and begin meaningful construction on several projects immediately. Kathleen Wynne can only take the media on so many pre-opening preview trips on the Union-Pearson Express and say, “See? We’re doing something” while no progress is being made on anything else before what’s left of Queen’s Park’s credibility evapourates. Queen’s Park is in a good position to present a few things as done deals. Scarborough LRT, Finch West LRT and Sheppard East LRT. They should simply take action on the already existing deals and move with speed. They have the authority, and frankly at this point the electoral position. I would say that there will be too much time lost playing with new alignments for the subway, and action is required now to address issues across the city. 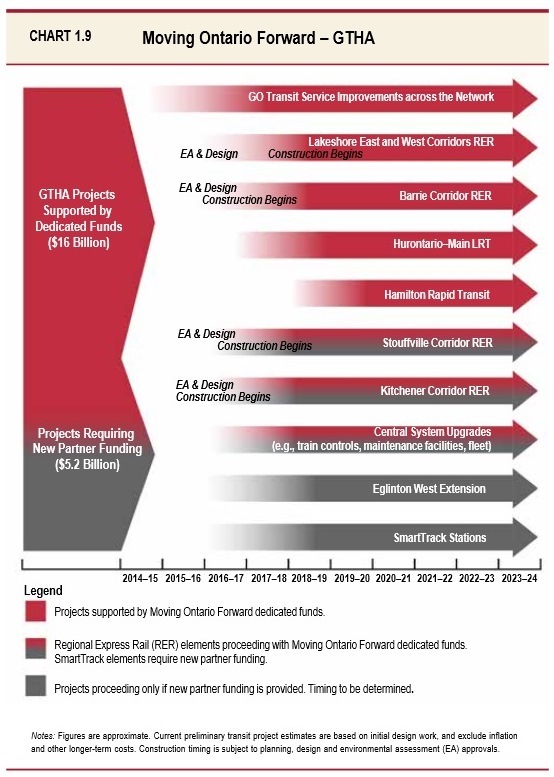 To sustain their credibility and make these projects regional in nature, means that they need to be extended far enough and be open enough to buses from the municipalities around Toronto, and/or link effectively to other modes – ie GO. They could preserve a great deal of credibility, and if done properly, actually extend the political capital. The issue everywhere is service not mode, and ending the game and getting on with business would help a great deal. The 2 LRTs are no enough in Scarborough to cover the area, well there is also a need for a better route for BRT, and more capacity, hit 2 birds with one stone. Build the BRT all the way to subway, but for gods sake start building, and build based on planning not politics. This would allow transit to go further faster for less. There is no go reason they could not build Finch West and Sheppard East at the same time. They could even start on Scarborough RT replacement if they were ambitious. These would be far enough along to be beyond cancelling by the next election, and they could show Toronto, and the province they were moving, without over sized excessively expensive projects. It would given them enough bang, with few enough dollars, that they would be hard to attack from anywhere, except those that were prepared to look extremely selfish and oblivious to cost. Could the OPC really attack them for spending too little to serve an area- when all the planning documents indicated it was the appropriate project? On May 15th the province announced GO service to Bramalea at some unspecified date in the future. All platforms were 12 car except Bloor, North Etobicoke and Georgetown. Bloor and North Etobicoke have just been rebuilt for 12 cars. Georgetown is beyond the scope of all day service and its platforms will be redone to allow for more service to Kitchener. Bramalea has been more than 12 cars long for a long time but the platform does need to be rebuilt. The old south platform for short turning trains seems to be abandoned. “An announcement on all-day, two-way comes hard on the heels of a major commitment on the part of the province to boost transit services across Greater Toronto including Peel Region. It also comes in tandem with a discussion at Peel Region Thursday about future transit needs. “At Peel regional council Thursday, Damian Albanese, Peel’s director of transportation, spoke of the important role of expanded train service to get the region moving as it braces for massive population growth. Steve: I don’t do multimedia here, although at times it is tempting.